We present observations of the interstellar interloper 1I/2017 U1 ('Oumuamua) taken during its 2017 October flyby of Earth. The optical colors B-V = 0.70+/-0.06, V-R = 0.45+/-0.05, overlap those of the D-type Jovian Trojan asteroids and are incompatible with the ultrared objects which are abundant in the Kuiper belt. With a mean absolute magnitude H_V = 22.95 and assuming a geometric albedo p_V = 0.1, we find an average radius of 55 m. No coma is apparent; we deduce a limit to the dust mass production rate of only 2e-4 kg/s, ruling out the existence of exposed ice covering more than a few m^2 of the surface. Volatiles in this body, if they exist, must lie beneath an involatile surface mantle ~0.5 m thick, perhaps a product of prolonged cosmic ray processing in the interstellar medium. The lightcurve range is unusually large at 2.0+/-0.2 magnitudes. Interpreted as a rotational lightcurve the body has semi-axes ~230 m x 35 m. A 6:1 axis ratio is extreme relative to most small solar system asteroids and suggests that albedo variations may additionally contribute to the variability. The lightcurve is consistent with a two-peaked period ~8.26 hr but the period is non-unique as a result of aliasing in the data. 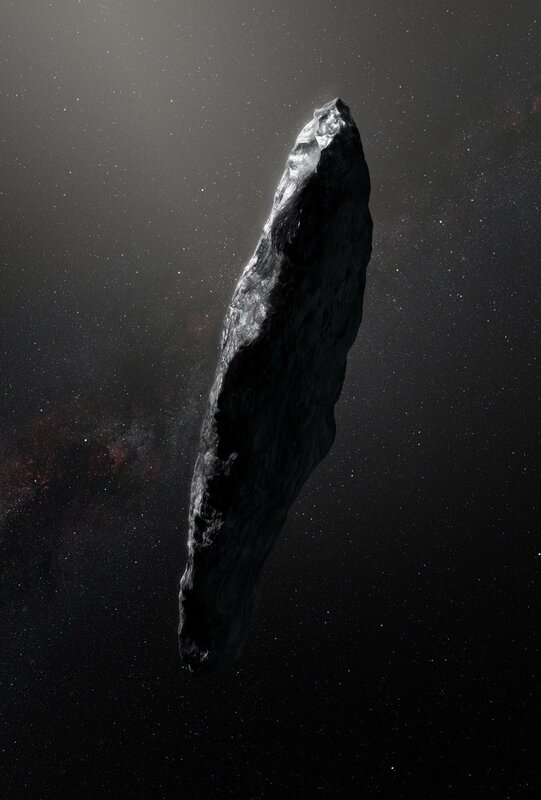 Except for its unusually elongated shape, 1I/2017 U1 is a physically unremarkable, sub-kilometer, slightly red, rotating object from another planetary system. 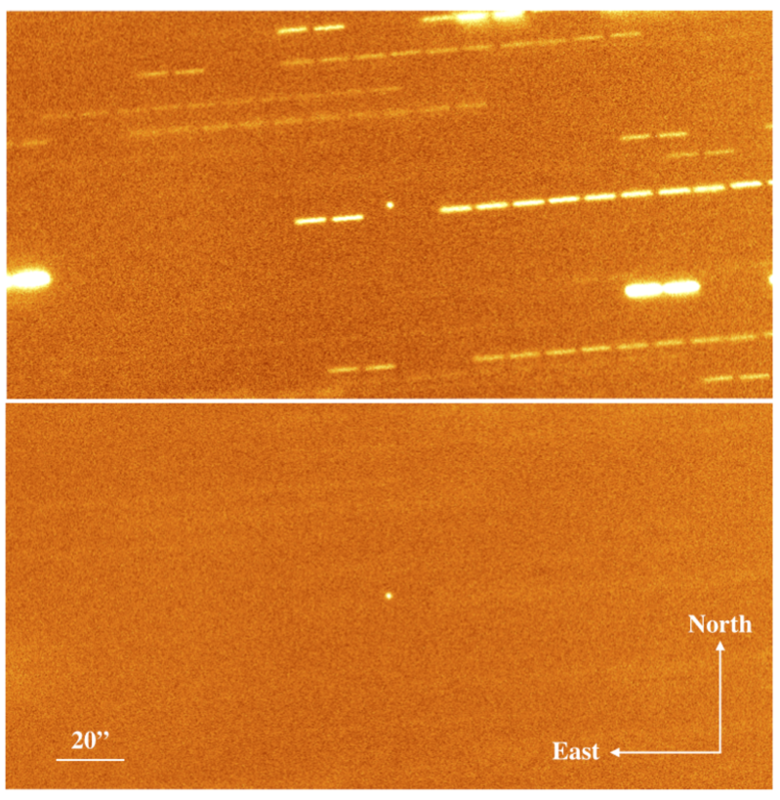 The steady-state population of similar, 100 m scale interstellar objects inside the orbit of Neptune is ~10,000, each with a residence time ~10 yr.
Caption: (left) Interstellar object 1I/2017 U1 imaged from the Nordic Optical Telescope in Las Palma on UT 2017 October 26, the day after the object was announced. The top image shows the average of 12 separate integrations taken with the telescope tracked to follow the object. The bottom object shows the median of the same images, in which the trailed field objects are largely suppressed. (middle) Animation showing the path of U1 through the solar system, courtesy of NASA. 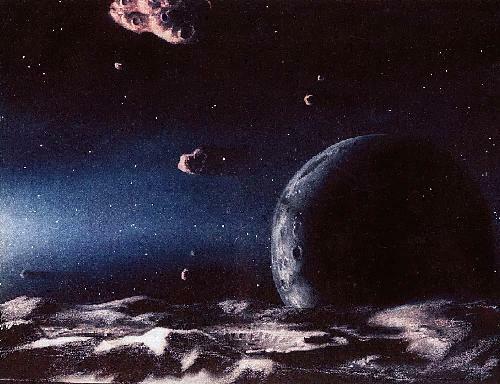 (right) Artist's impression of U1 seen close-up. Image credit: ESO/M. Kornmesser. U1 is a 100 m scale solid object ejected from orbit around another star. It could be billions of years older than the Sun.